When an organization implements KCS, content creation becomes an integral part of the support process. Each tech is responsible for contributing new content and updating or improving existing content. When a tech receives a ticket, the tech first search the existing FAQs for a documented fix. If found, the tech follows the instructions in the FAQ and updates them accordingly if any steps have changed. The tech can also attach the FAQ to the ticket. If not found, the tech troubleshoots and resolves the issue, then creates a new FAQ to document the section. 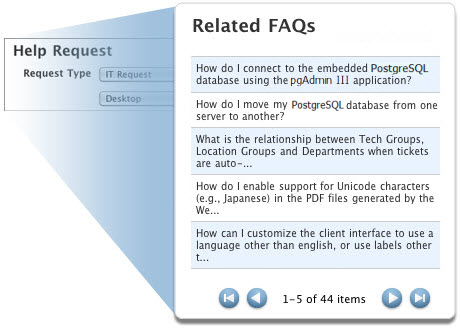 Within Web Help Desk, you can use FAQs to capture solutions to common problems and make that information available. Techs can quickly create a new FAQ based on a note within a ticket, or they can . As you increase the amount of useful information in your system, both clients and techs will be more likely to find the answers they need. Helping clients get answers from FAQs will reduce the number of tickets opened. Clients are able to provide feedback by rating articles. Use article ratings to recognize and reward useful content and to improve content that is incomplete or inaccurate. By default, only admins can edit approved FAQs. To implement the KCS process, consider including the Approved FAQ Edit permission in the Default tech permission set. When techs have this permission, they can update or correct FAQs as needed. Web Help Desk promotes self resolution by displaying relevant FAQs to clients as they enter service requests into the Web portal. In addition, clients can search the FAQs that are available to them, view or edit an FAQ, and link an FAQ to a support ticket. An FAQ can be available to all Web Help Desk clients, or it can be limited to a specific audience (for example, only to clients from a certain company).